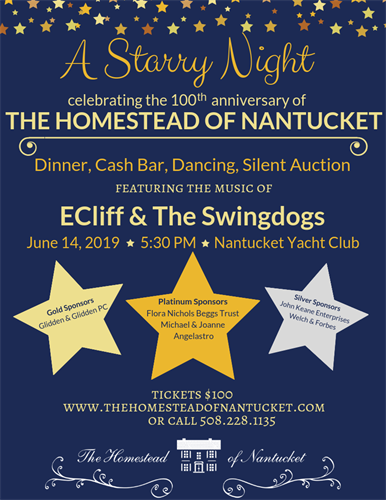 Come celebrate the 100th anniversary of The Homestead at The Nantucket Yacht Club on Friday June 14th starting at 5:30PM. The evening features dinner, dancing to the music of ECliff & The Swingdogs, cash bar, & silent auction. Tickets are $100 and are available through our website: www.thehomesteadofnantucket.com, or call us at 508-228-1135.